Organometallic complexes, which consist of centrally located metals and peripheral organic compounds called ligands, are the workhorses of organometallic chemistry. Just like organic intermediates, understanding something about the structure of these molecules tells us a great deal about their expected reactivity. Some we would expect to be stable, and others definitely not! A big part of our early explorations will involve describing, systematically, the principles that govern the stability of organometallic complexes. From the outset, I will say that these principles are not set in stone and are best applied to well controlled comparisons. Nonetheless the principles are definitely worth talking about, because they form the foundation of everything else we’ll discuss. Let’s begin by exploring the general characteristics of organometallic complexes and identifying three key classes of organic ligands. When we think of metals we usually think of electropositive atoms or even positively charged ions, and many of the metals of OM chemistry fit this mold. In general, it is useful to imagine organic ligands as electron donors and metals as electron acceptors. When looking at a pair of electrons shared between a transition metal and main-group atom (or hydrogen), I imagine the cationic metal center and anionic main-group atom racing toward one another from oblivion like star-crossed lovers. In the opposite direction (with an important caveat that we’ll address soon), we can imagine ripping apart metal–R covalent bonds and giving both electrons of the bond to the organic atom. This heterolytic bond cleavage method reproduces the starting charges on the metal and ligand. Unsurprisingly, the metal is positive and the ligand negative. Behold, it is the east! And carbanion is the sun! Of course, things get pretty crazy when you start pulling apart multiple covalent bonds at metal centers in this way. Take, for instance, this complex of palladium surrounded by three fluorine atoms, a carbon atom, and two nitrogens. Does the 4+ charge make sense?! A 4+ charge?! Get used to that in organometallics class. Turns out that it does, as long as you remember that using this heuristic is best for relative comparisons. +4 charges, from nature’s perspective, are nonsense and are rarely, if ever, encountered. They don’t exist except in the fanciful world where we can toss electrons around to our heart’s desire, so don’t go tell your professors that some blog on the Intertubes told you that +4 charges are real. However, these mental gymnastics featuring large charge values are still useful! For instance, we would expect a palladium atom that ends up with a charge of +4 after applying this method to be more positively charged than an analogous palladium atom that ends up with a smaller charge. Practically speaking, I think of these charges as scale factors more than anything else;* i.e., an atom with a formal charge of +3 has roughly three times the positive charge of the same atom with a formal charge of +1. 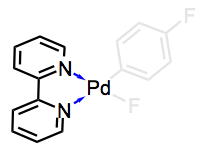 This Pd(2+) complex is not as positive at palladium as the Pd(4+) complex above. Now that we understand how to deconstruct M–R covalent bonds and assign formal charges to metal centers, let’s address that little caveat about ripping apart M–R bonds that I mentioned before. Let’s play a little game of Lights Out and flip the lights on the complex in the second figure. You may notice that there is something a bit off about the palladium-nitrogen bonds. Shouldn't the nitrogen atoms be positively charged? Each nitrogen atom is associated with four bonds total, but the atoms are drawn as neutral. Why is this so, when conventional organic wisdom tells us that those nitrogens should be positively charged? Let’s follow our previous procedure and give both electrons of the Pd–N bond to nitrogen. After doing this, notably, the nitrogen becomes neutral, not anionic. Should we increase the charge on palladium by two at this point? The nitrogen atoms become neutral. Should Pd have a charge? Representations of the dative bond in OM chemistry. Truth is, you can draw dative bonds in OM complexes using any of the three equivalent formulations above. We will encounter situations where even the polar form on the far right is useful. I prefer the arrow form myself. And now hear this: any ligand atom that remains neutral after our bond cleavage procedure can be thought of in this way. We’ll refer to these formally neutral ligands as L ligands, and formally negative ligands (like –CH3) as X or X– ligands. For reasons that will soon become clear, it is critical to recognize the difference between these ligand types. For one thing, we must correctly distinguish L- and X-type ligands to correctly assign formal charge to the metal center. A discussion of ligand types would not be complete without a nod to the third, less common ligand type: another metal center! How do we think about M–M bonds? Usually, it is most useful to imagine these as coming from the sharing of one electron from each metal center. Instead of giving both electrons of the M–M bond to one metal center, we imagine giving one electron to each M to deconstruct the bond. Since we don’t mess with electron pairs, charges on the metal centers do not develop during this homolytic bond cleavage process. In a future post, we’ll discuss why metal-metal bonding in organometallic complexes can be important; for now, note that metal-metal bonding can change the number of electrons around a metal center without altering its formal charge. Here’s a summary outlining how to deconstruct the Pd(2+) complex we’ve worked with so far. Rationally separating the properties of the metal and ligands through deconstruction is a critical skill for the organometallic chemist. FYI, you might see the blue bipyridine referred to as an L2 ligand elsewhere; this just means that a single bipyridine molecule possesses two L-type binding points. Ligands with multiple binding points are also known as chelating or polydentate ligands. Chelating ligands may feature mixed binding modes; for instance, the allyl ligand is of the LX-type. Chelating ligands can also bind to two different metal centers; when they act in this way, they’re called bridging ligands. But don’t let all this jargon throw you! Deconstruct complexes one binding point at a time, and you cannot go wrong. Next, we’ll take a closer look at the metal center and expand on the purpose of the deconstruction process described here.